There’s an old saying that opposites attract and that’s often true. There was a story in the local paper recently about the decline of greeting cards due to the increasing popularity and usage of electronic versions and social media. Stats back up this trend. A U.S. Postal Service study which shows correspondence (like greet­ing cards) fell 24% between 2002 and 2010. Hallmark estimates the number of greeting cards sold in the U.S. has fallen by 20% in the past decade. It’s certainly great to log onto Facebook on your birthday and read dozens of birthday wishes from friends and family (most of whom probably would not have mailed you a physical card). But, isn’t there something special about opening the mailbox to find an envelope with your name on it, written by hand? That’s a great example of the opposite (of the norm) having a positive effect. The same principle applies to business or job searching. Most job applications are filed electronically and many of the larger companies have their own applicant tracking system in place. Conventional job search wisdom is to send a thank you following an interview. What if, instead of emailing that note, you mailed a physical thank you card and wrote your note by hand? Don’t you think it would stand out (in a positive way) in this ever-increasingly electronic age? With business, when everyone sends an email, why not pick up the phone? Don’t forget the power of a sincere “thank you” in business – and to do something to make that thank you memorable. At the end of the day, if you want to stand out from the crowd, sometimes you zig when others zag. It may not always be true, but very often opposites do indeed attract. Companies need to tread lightly when it comes to marketing around a natural disaster. With Superstorm Sandy, 100+ people died worldwide and damage estimates are at $20 Billion and growing. That doesn’t make for a great marketing opportunity in most instances, but it can, if done correctly. American Apparel caused a Twitter firestorm when they offered a Hurricane Sandy Sale. As if that wasn’t tasteless enough, their headline read “In case you’re bored during the storm.” Seriously. The company was slammed on social media with outrage and rightly so, in my humble opinion. Closer to (my) home, and with much less publicity, a local winery committed a similar marketing faux pas. 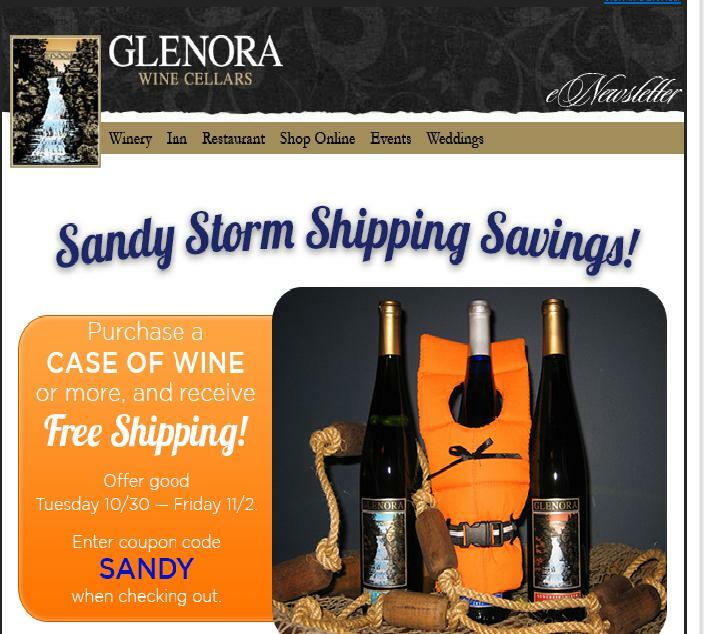 Glenora Wine Cellars offered customers a Hurricane Sandy Sale. While not as egregious, I still thought it was in very poor taste (especially the picture). I made my opinion known on their Facebook page, commenting on their post about the promotion. Within hours, their post (along with my comment) was removed. Their website still offered the promotion, and I called them out on Twitter for it. Within hours, their web page promotion was removed too. What couldn’t be removed were the emails the winery sent out to their list. So what’s a “good” way to market around a natural disaster? How about showing some compassion? How about figuring out how to help the victims through a donation of time, talent, product or service? Duracell brought charging stations to Lower Manhattan so that those without power could charge their cell phones. They’re helping victims of Hurricane Sandy and garnering positive publicity and public relations in the process. It’s such a simple concept when you compare the positive example to the negative ones, isn’t it? Yet so many companies get it wrong. One would hope that marketers would learn from these mistakes. Sadly, history will likely repeat itself and some company will damage their image and reputation by running a tasteless promotion during the next natural disaster. Hopefully, they have a public relations department or company at their disposal. Even better would be to employ some common sense. Before you donate in a time of crisis, make sure you do your homework on the charitable organization. Here are some tips by Charity Navigator. In the first part to this post, I covered three areas you can and should update to make it easier for people to contact you on LinkedIn. If you haven’t read that post yet, I encourage you to do so now, as it contains an important overview on where to check/change your various profile settings and preferences. 4) Do you have groups displayed? You don’t need to display all groups that you belong to, but you should display a few core groups. Select settings in the drop-down menu next to your name in the upper right part of your home page. Then go to Profile. 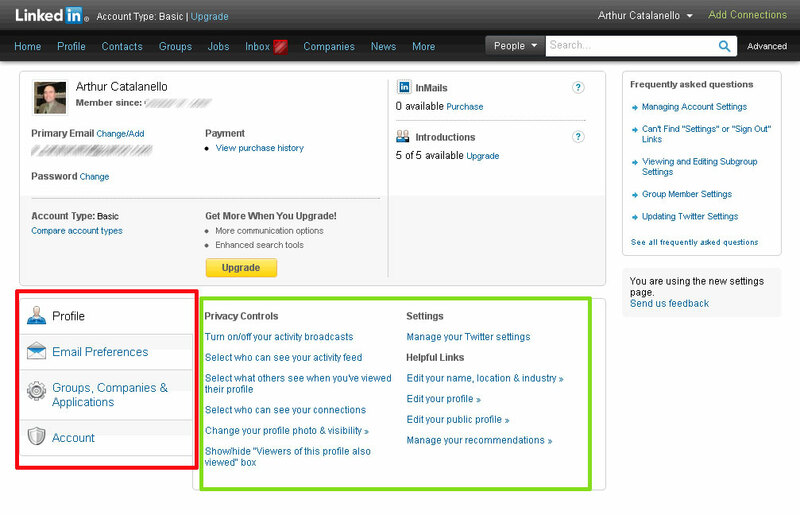 To the right you’ll see “Helpful Links: Edit Your Profile.” Scroll down to the groups section on your profile. Next to each of the groups you belong to should be a link for “change visibility.” If you click on that link, it will bring you to the “your settings” page for that group. The first setting is visibility (the red highlighted box in the screen capture below). Select or deselect accordingly. 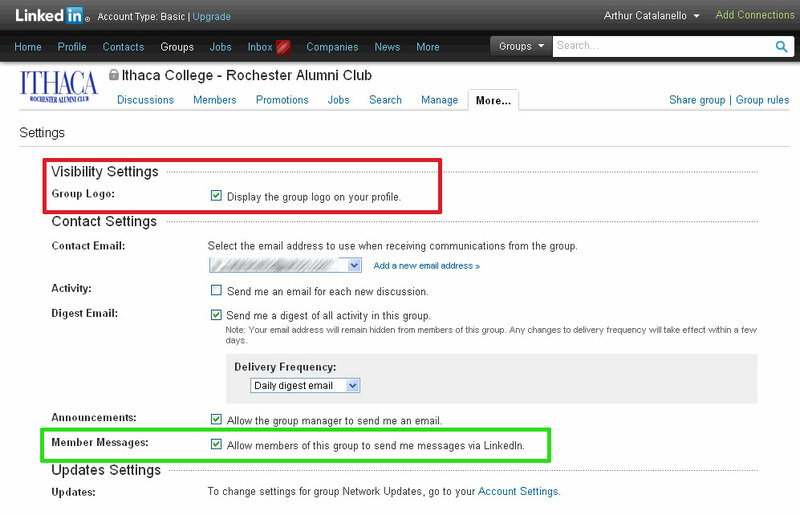 5) Do you allow group members to contact you? If groups are moderated well, spam shouldn’t be an issue. If it is, notify the group manager or leave the group. If you’re open to being contacted for the opportunities you’ve specified, this is the easiest way to facilitate that. Follow the steps outlined in the previous point and review the settings in the green highlighted box of the screen capture above. What sections of your LinkedIn profile have you improved as a result of this post or Part 1? What other areas of your profile have you utilized to make it easier for others to contact you? I’m actively recruiting LinkedIn members for a LinkedIn Group I created and manage. It’s been an interesting endeavor, as some people have made it easy to be contacted and others have made it so challenging that I question their motives for having a LinkedIn profile. Why do you have a LinkedIn profile? Whatever your reason, do you hope to be contacted if someone finds your profile? Do you make it easy for others to contact you, or have you created a challenge that will frustrate some and possibly risk missing a golden opportunity? I’ve identified six areas of your profile that can be used to make it easier to be contacted by others. To provide the necessary detail on where these areas are located and how you can change them, I’ll split this post into two parts. Part 2 will be posted next week. In the above screenshot, you’ll notice there are three areas that you can (and should) complete: messages, opportunities, and advice. 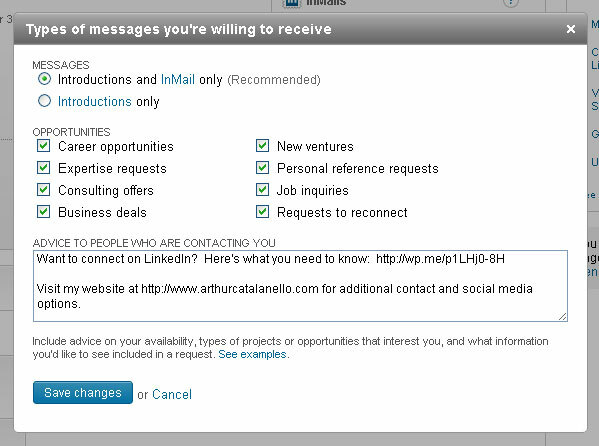 Give some thought as to why you’re on LinkedIn and the opportunities you’re interested in being contacted for. I recommend that you complete all three areas. Under the advice section, you can put contact information if you so choose. 2) Do you have websites listed? Select settings in the drop-down menu next to your name in the upper right part of your home page. Then go to Profile. To the right you’ll see “Helpful Links: Edit Your Profile.” Scroll down and make sure you include at least one website listed, especially if it will help someone find you (assuming you’re on LinkedIn to be found). You can include up to three websites, so take advantage! In the second part to this post, I’ll cover groups and your profile summary. Until then, how did you do on the first three areas? Do you currently utilize them to make your profile more contact friendly? Most people involved with social media, even casual users, have likely come across an account that’s been inactive for weeks, months or even years. I’m sure they were originally created with the best of intentions yet for one or more reasons, they’ve been abandoned or forgotten about. For some, the account may have been abandoned because the goal was attained (perhaps he used social media to increase visibility with his job search and was hired). For others, maintaining the account was possibly a sacrifice that was made due to time constraints. Maybe others didn’t meet their objectives and decided to discontinue their social media efforts because it failed in their eyes. There are a few problems abandoned accounts can cause the active user. The first is having to determine whether or not an account you’re initially interested in following is active. It’s an unfortunate part of the process. Another is that some abandoned accounts have coveted user names. Freeing coveted-yet-abandoned user names could be beneficial for marketing purposes (professional and/or personal). Lastly there’s the image problem abandoned accounts create, but that’s a problem they’ve brought upon themselves. In the world of social media, what do you think can be done to clean up abandoned accounts? Should accounts that have been inactive for a lengthy period of time be suspended or deleted in an effort to “protect” active accounts and improve the experience for active users? But what if the account was abandoned for a more serious reason? I read an article this past weekend which described a grieving mother whose son died in a motorcycle accident. She wished to access his Facebook site in hopes of interacting with his friends to keep his memory alive. The article raised a great question as to whether or not your digital footprint can be considered part of your estate. I’ll be honest – I’ve never thought about what would happen to my social media sites and email accounts if something tragic should happen to me. What are your thoughts on abandoned accounts? Do you have a different opinion when the cause of abandonment is one of neglect versus one of tragedy? The BBC Lottery. Apparently I’m a big winner if I’ll only provide personal details and/or click on their sure-to-be-infected attachment. Mr. John Adam of the FBI wants to speak with me about something. Uh-oh. I didn’t do it. I swear! The United Nations Exhibition 2011 has a grant donation they’d like to make to me. A message from a “Dear Friend” whom I’ve never heard of before. A message from a princess. Yes, a real, live princess! She needs my urgent help and trust! Like any email marketer, their goal is to get me to open their email and take an action (click on a link, open an attachment, reply with details, etc.). With subject lines like the above, how do you think they did? Did they have a high open rate? Did they achieve a high click rate? What was their open-to-click ratio? What was their conversion rate? As “marketers” of their own spam content, when it comes to my personal email account, they fail miserably at marketing.